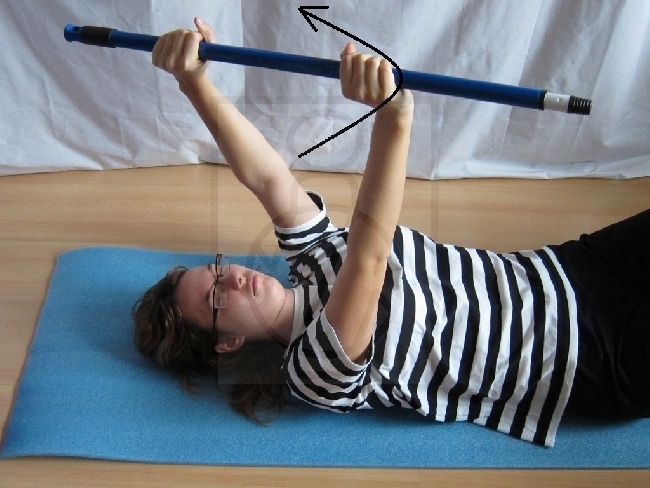 Basic training for the recovery of mobility, flexibility, strength and stability of the shoulder (arm) joint. 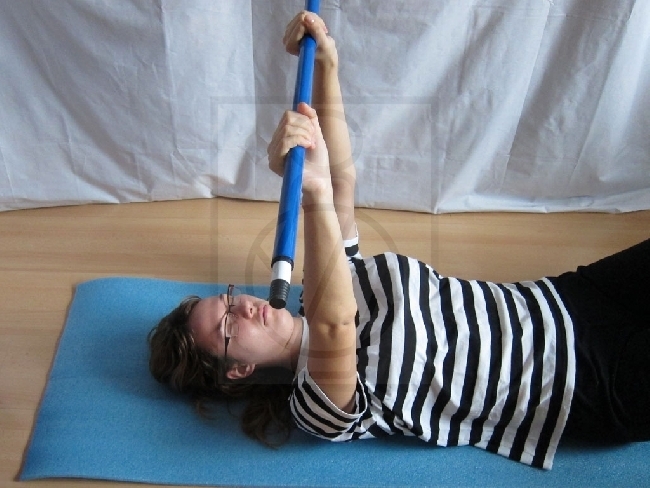 Simple rehabilitation exercises for the shoulder joint problems, easily performed at home. Despite the slow progress, each exercise shall be performed every day. Those that cause pain are skipped, continue with other exercises, and later return to them. Start position: Lie on the back, legs bent in the knees, or stretched, whichever is more comfortable for you. Hands beside the body. 1. 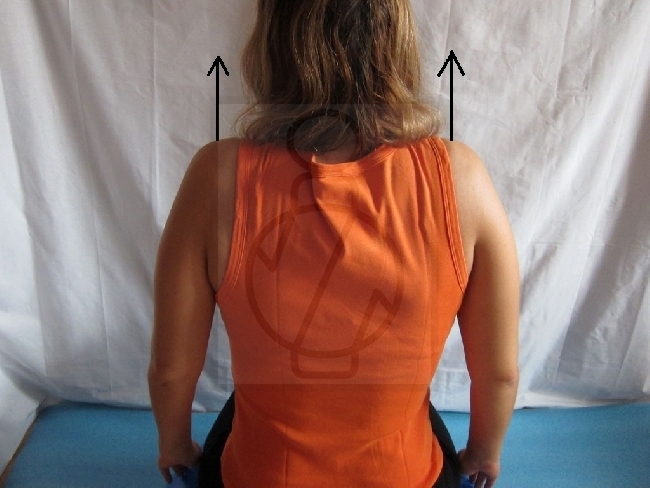 Starting position - Grasp a weakened hand (with limited mobility in shoulder joint) with healthy hand - 1A and raise both stretched arms behind your head when inhale- 1B. Return with exhale. Repeate6 times. 2. 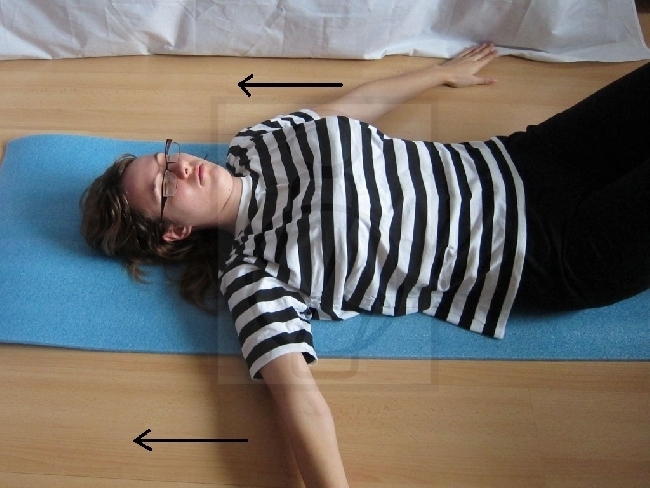 Starting position - 2A, 2B – stretch arms sideways when inhale, move is coming from the arms, hands are still supported by mat – they are rubbing on the mat. Return to the starting position with exhale - 2A. Repeated 6 times. 4. Starting position - 4A, 4B - hugging - Hands raised with a bent elbow and forearm is brought across the chest so the palm rests on the opposite shoulder. 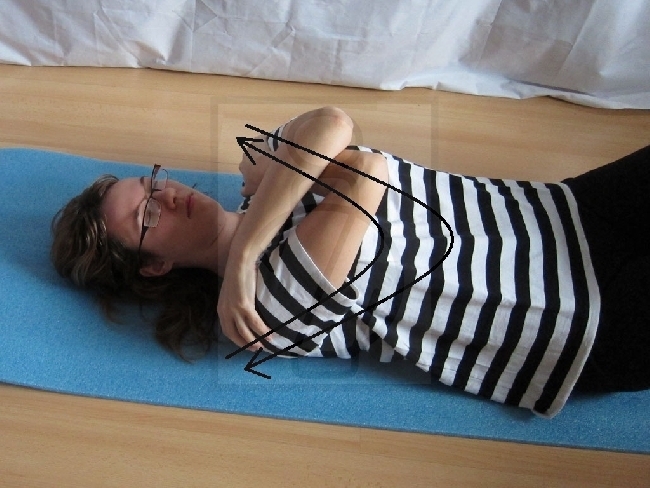 Remain in this position and slowly count to five, then release the arms and return to starting position. Repeat 4 times. Breathe. 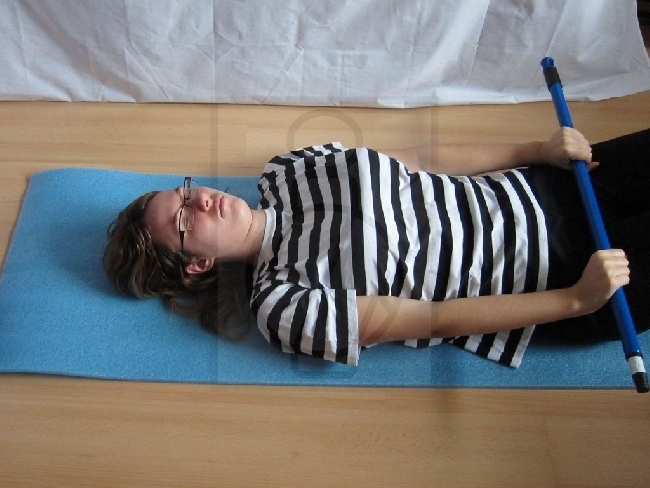 Start position: Lie on the back, legs bent in the knees, hands beside your body, grab the stick in both hands at shoulder width (as a stick you can use handle of a broom, mop, etc.). 1. Starting position - 1A. 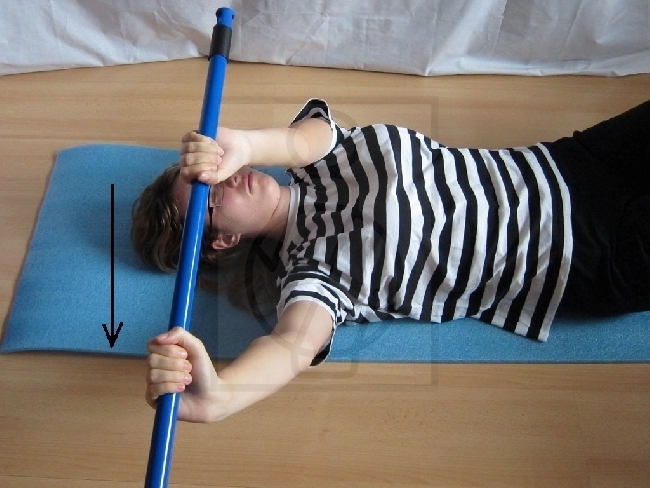 We lift the stick with both hands behind your head - 1B. Try to stretch out your hands as much as possible and put them on the ground behind your head - inhale. Return to the starting position - 1A - exhale. Repeated 6 times. 2. Starting position - 2A. Lift your stick in front of you - 2B. Hold it firmly and bow to the right (to left) - 2C - inhale, stick back straight ahead - exhale - 2B. Repeat six times on each side. 3. Starting position-3A. Stick lifted straight ahead - 3B - inhale. Move the stick with hands and arms to one side, so we can get it to the parallel position with out body - exhale - 3B. Move it to the both sides 6 times. 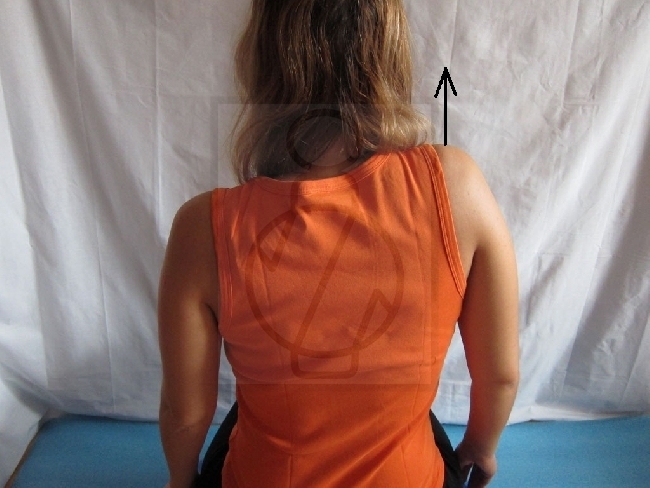 Starting position: sitting on a chair, the arms beside the body. 1. Starting position - 1A. Both arms pulled upward, as if you wanted to touch your ears - inhale - 1B. Exhale - arms back to the starting position - 1A. Repeated 6 times. 2. Starting position - 2A. Raise right shoulder and pull it upward with inhale- 2B, go back to the starting position with exhale- 2C, raise the left arm - 2D – inhale, back to the starting position - 2A - exhale. Repeat 4 times with each arm alternately. 3. Starting position - 3A. 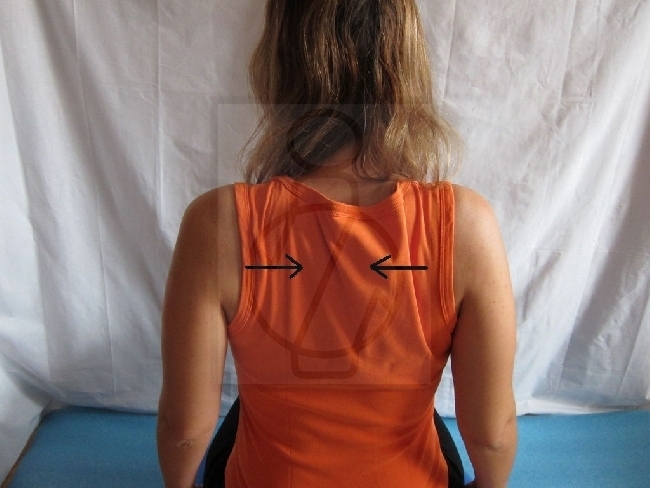 Put your shoulder blades together with inhale. Try to put them as much closer to each other as possible - 3B. Back to the starting position with exhale - 3A. Repeat 6 times. 4. Starting position - 4A. With inhale, perform exercises number 1 and number 3 - raise arm and put shoulder blades together - 4B. Back to the starting position with exhale. Repeat 4 times. 5. Starting position - 5A. 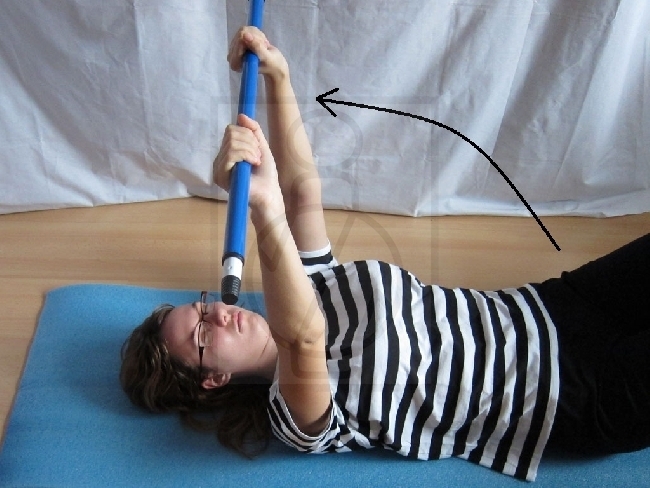 5B - Shrug hands at the elbow and grasp the arm with fingers. 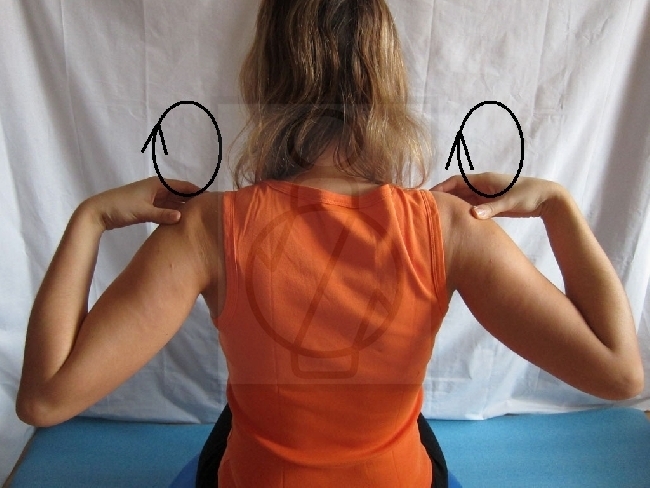 We perform circular movements in the shoulder joint with these "small" hands for 4 times on one side and the other. Breathe freely. 1. Bend in the standing position and alternately swing hands back and forth. When the right hand is in front position, then left is in the forth position. The movement comes from the shoulder joint, in which you try to increase range of motion. The movement should be easy and may not cause pain. 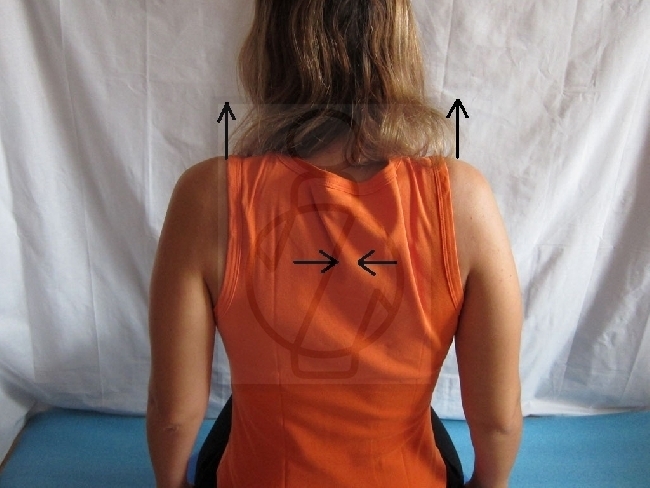 The head is in the level of the body, do not bend it backward in the cervical spine. Repeat 6 times. 2. Bend forward in standing position. Cross hands before you and swing them to the sides. Each hand does movement to own side. The movement should be easy and may not cause pain. 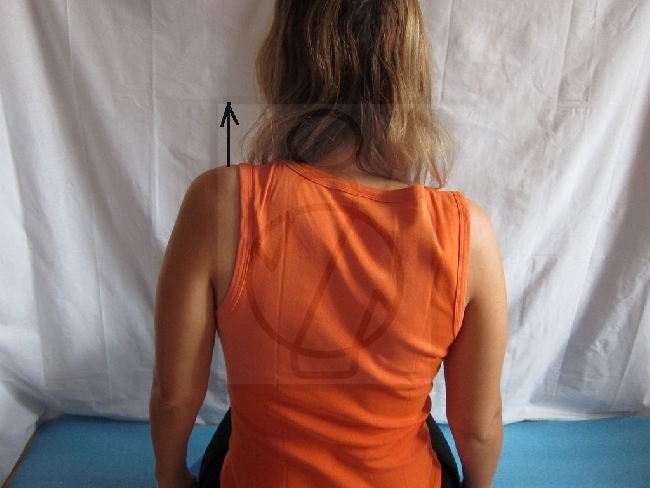 The head is in the level of the body, do not bend it backward in the cervical spine. Repeat 6 times. 3. Face the table. Use both hands to rub the table forward. 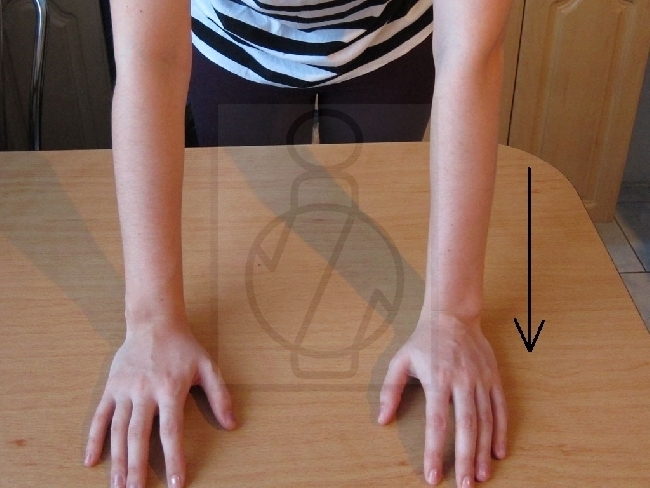 Try to reach with your fingers as far as possible on a desk.. In doing so, lean forward according to the needs, do not bend head backward, keep it in the level of the body. The movement should be easy and may not cause pain. Repeat several times a day according to your needs. 4. Standing against the wall. Rub wall upwards with palms. Hand gently stretching. Practice with both hands simultaneously, and also, each hand separately. The movement should be easy and may not cause pain. Repeat several times a day according to your needs.